At the Backup Server step of the wizard, specify backup server settings. 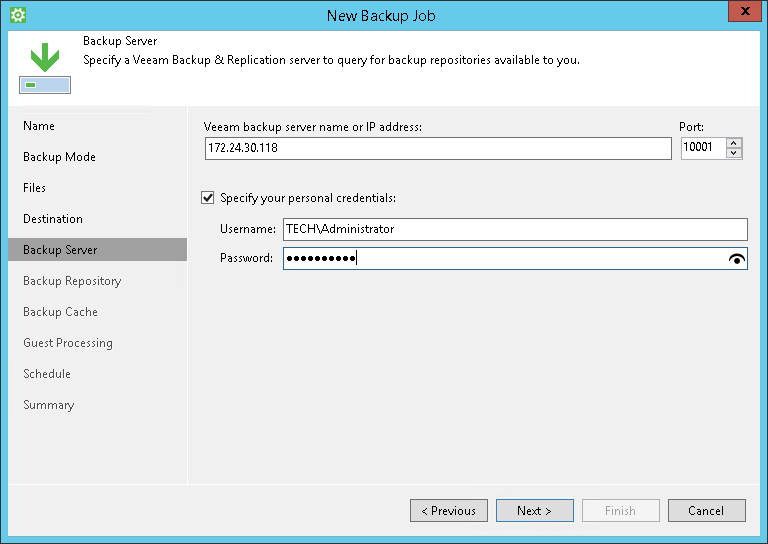 At the Backup Repository step of the wizard, select the Veeam backup repository. The Backup Server step of the wizard is available if you have chosen to store backup files on a Veeam backup repository. In the Veeam backup server name or IP address field, specify a DNS name or IP address of the Veeam backup server. In the Port field, specify a number of the port over which Veeam Agent for Microsoft Windows must communicate with the backup repository. By default, Veeam Agent for Microsoft Windows uses port 10001. Select the Specify your personal credentials check box. In the Username and Password fields, specify a user name and password of the account that has access to this backup repository. Permissions on the backup repository managed by the target Veeam backup server must be granted beforehand. To learn more, see Setting Up User Permissions on Backup Repositories. If you do not select the Specify your personal credentials check box, Veeam Agent for Microsoft Windows will connect to the backup repository using the NT AUTHORITY\SYSTEM account of the computer where the product is installed. You can use this scenario if the Veeam Agent computer is joined to the Active Directory domain. In this case, you can simply add the computer account (DOMAIN\COMPUTERNAME$) to an AD group and grant access rights on the backup repository to this group. If you plan to use a commercial version of Veeam Agent for Microsoft Windows with Veeam Backup & Replication, you must install the Veeam Agent license in Veeam Backup & Replication in advance, before connecting to the backup server. If you specify a DNS name of the Veeam backup server, make sure that the Veeam backup server name is resolved into IPv4 address on the machine where Veeam Agent for Microsoft Windows is installed. The Veeam Backup Service in Veeam Backup & Replication listens on IPv4 addresses only. If the Veeam backup server name is resolved into IPv6 address, Veeam Agent for Microsoft Windows will fail to connect to the Veeam backup server. The Backup Repository step of the wizard is available if you have chosen to save backup files on a Veeam backup repository. From the Backup repository list, select a backup repository where you want to store created backups. The Backup repository list displays only those backup repositories on which you have permissions to store data. To store Veeam Agent backups, you can use a simple backup repository or a scale-out backup repository. To refresh the list of backup repositories, click the Refresh button at the top right corner of the Backup repository field. 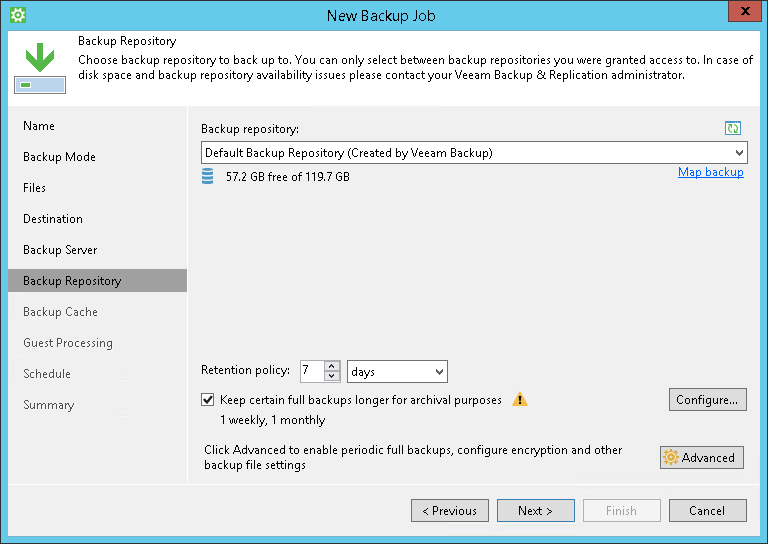 Backup repositories list refresh may be required if you change permission settings for a specific backup repository on the Veeam backup server and want to display this backup repository in the New Backup Job wizard. To learn more, see Setting Up User Permissions on Backup Repositories.